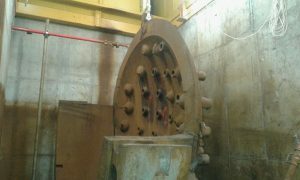 NUSIM, S.A. Has completed the segmentation of the old reactor lid of the José Cabrera N.P.P. 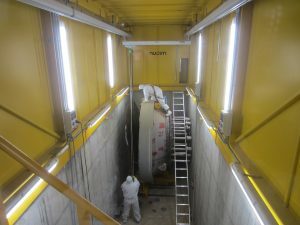 within the Dismantling and Closure Project (PDC) that ENRESA carries out in Almonacid de Zorita (Guadalajara). The replacement of the lid of CN Jose Cabrera’s vessel was made in the 21st refueling (year 1997). The old lid was stored in the pit 2 of the Waste Warehouse no1. To proceed to segmentation NUSIM, S.A. Designed and supplied a new cutting SAS in the waste warehouse, which was adapted to the geometry of the pits of Warehouse no1. 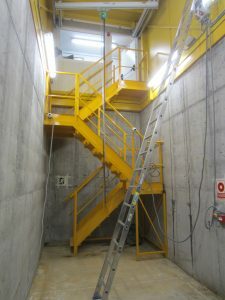 The SAS is an autonomous equipment that can be moved to all the pits of Warehouse no1 to carry out segmentation inside. 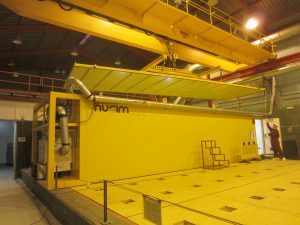 The scope of NUSIM includes the engineering, documentation and manufacturing of the cutting SAS, as well as the exploitation of the same for the work of segmentation of the old reactor lid and another 40 tons of miscellaneous materials from the PDC. The SAS is equipped with ventilation system, power supply for tools, lighting, fire alarm system, bridge crane, CCTV and supervisory room. The largest work done in the interior has been the segmentation of the old reactor lid, which has been made using water-cooled diamond wire. 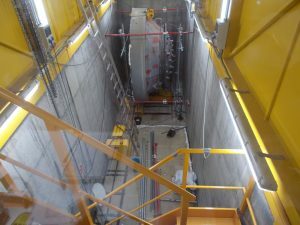 The pieces from the segmentation have been placed inside concrete containers CE-2a for later storage in the storage center of El Cabril.